I’ve been asked to be an Artist in Residence! Cathryn demonstrating hole-to-hole lace caning. A few months ago I was asked to be the September Artist in Residence at North House Folk School in Grand Marais, Minnesota. My stint will be for four days, Thursday-Sunday, September 22-25, 2016. 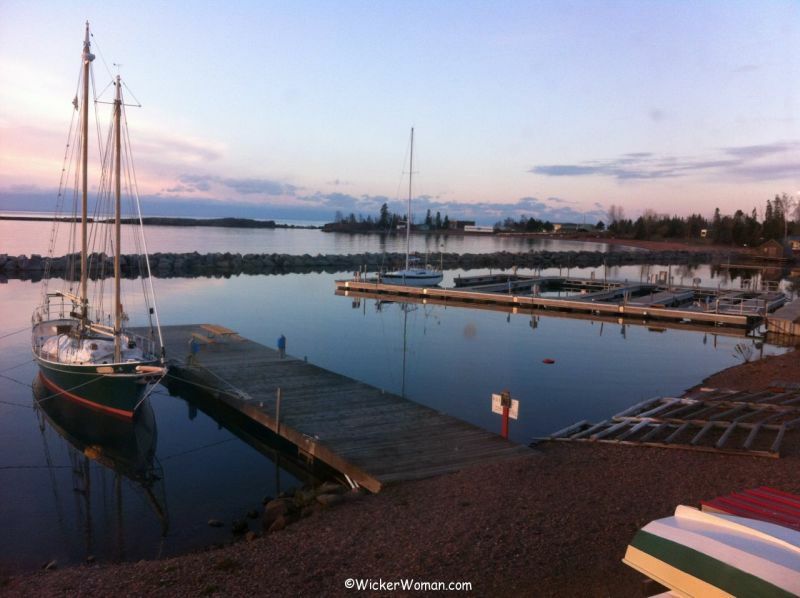 North House is way up on the northeastern edge of Minnesota, located on the north side of beautiful Lake Superior, only 40 miles from the Canadian border. 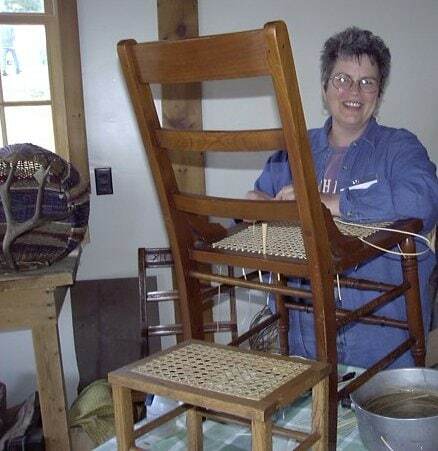 I’ve taught chair seating and basketry there almost every year since 1999. But this is the first time I’ve ever been asked to be the Artist in Residence anywhere before! So now what? What does an Artist in Residence do? OK, so I had no idea what an Artist in Residence is supposed to do. But thankfully, I was able to talk to two of the previous Artists and got to pick their brains about it. Basically, what you do is to demonstrate and talk about your craft to people coming on campus. That’s a piece of cake for me! I just love to talk about all types of chair seat weaving techniques, antler baskets and other types of basketweaving, showing folks how it’s done and bringing them into the fold! 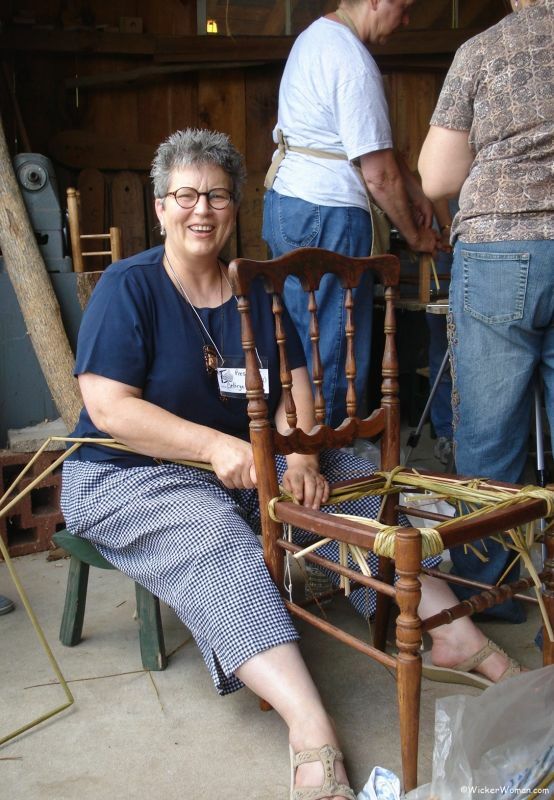 Cathryn weaving a hand-twisted cattail leaf seat. The absolute best is when I see the sparkle in the eye of a viewer and I know for certain they are hooked on the craft and want to learn more! Oh, and the kids–they are like sponges wanting to soak up every little drop of what you are saying and showing them. These are the seat weavers of the future, the ones to perpetuate the crafts to make sure they don’t become lost arts. I’m taking up a bunch of different kinds of chairs to weave a variety of materials, using several weaving techniques and patterns. And also taking antler basket frames with their weaving materials and onion basket stuff. Then on Saturday from 10am-1pm I’ll be teaching a small, square splint footstool class. Size is limited so register to reserve your spot! 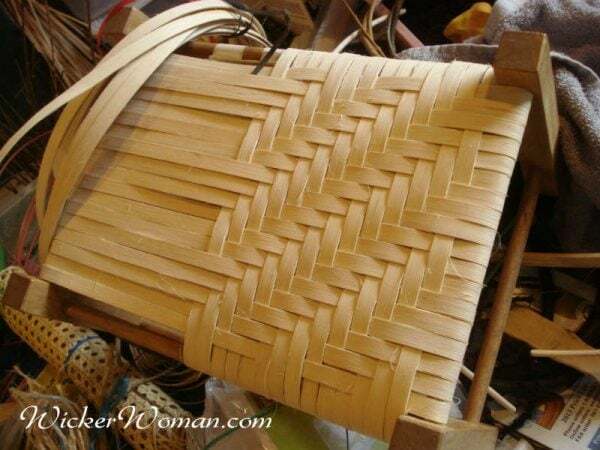 After the footstool class, I’ll probably start weaving some baskets, just for a diversion and to spice things up a bit. 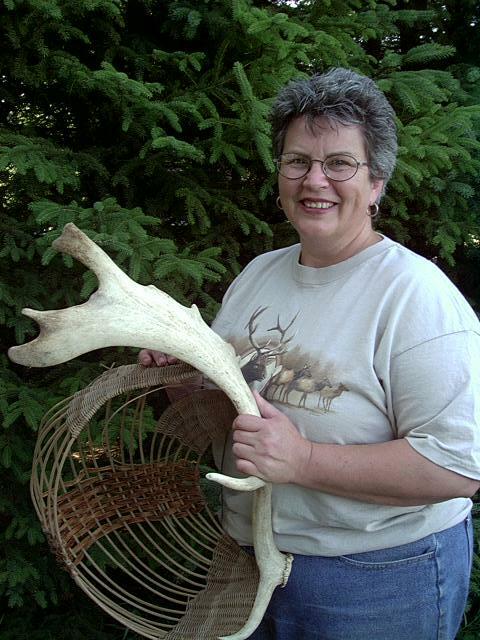 Have you ever watched someone weave up an antler basket or make the very useful Onion Basket? Now for the fun of being an Artist in Residence! Won’t you join me up at North House as I try my hand as a first-time Artist in Residence position? Hopefully, the weather will cooperate so we can do this all outside, but if not, there’s plenty of room in the Red or Blue buildings for my demonstrations. Have questions? Now’s the best time to ask them and get your answers, I’m “all ears” all weekend. 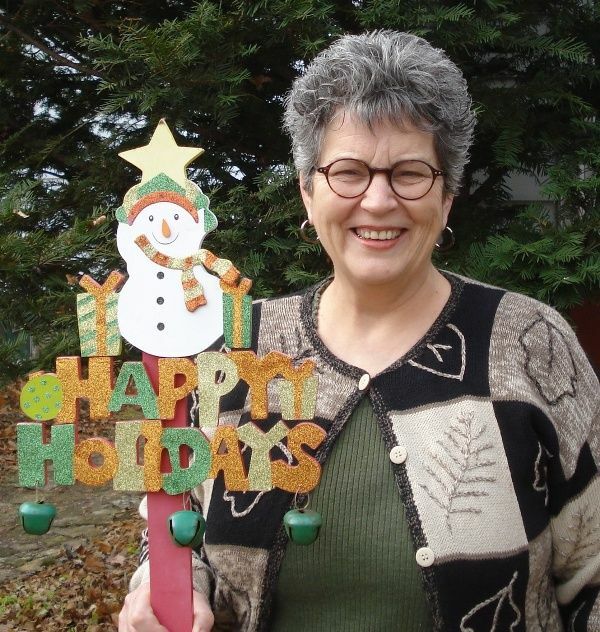 This is what my wicker business is all about and has kept me in the field for over 40-years! 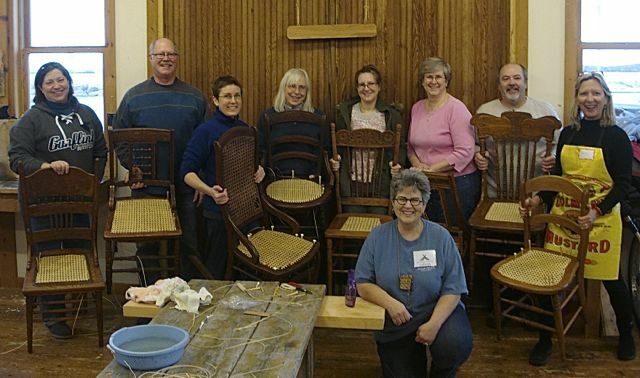 Spreading the word about the craft, engaging my viewers through demonstrations and classes and then watching as they immerse themselves and blossom in these wonderful, traditional crafts of chair seat weaving and basketry. Come and examine the materials, watch the weaving techniques and join us on Saturday experience the seatweaving tradition “first hand” and enjoy the day! Have you ever been an Artist in Residence? If so, please share your experience with us in the comment section below!